The original Dungeon Defenders offered a very interesting action RPG – Tower Defense hybrid, allowing players to take an active role during the defensive phase. This unique blend is now back with Dungeon Defenders II, with some new mechanics and features that make the experience slightly deeper, but not necessarily better. Dungeon Defenders II’s premise is quite simple. The Kingdom of Etheria is under attack by the minions of the Old Ones, seeking to free them from the Eternia Crystals. It’s up to the players to prevent the Old Ones from getting released and save the people of Dragonfall. Dungeon Defenders II’s story elements are quite basic, but this isn’t a huge issue, as there are other reasons to play the game. 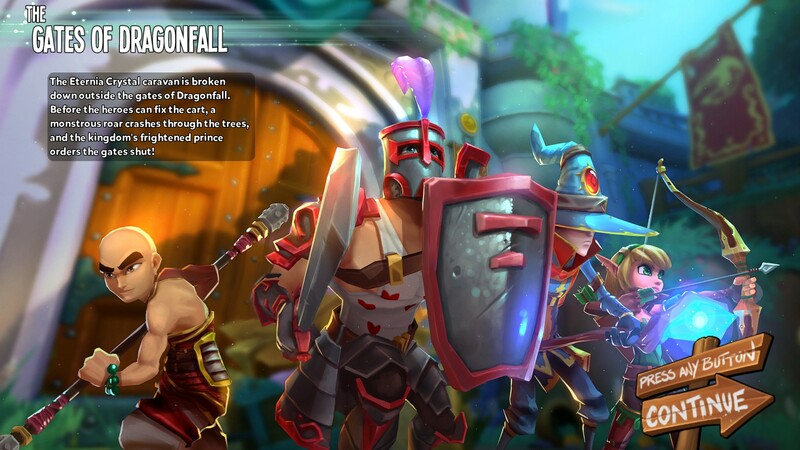 Like its predecessor, Dungeon Defenders II offers a unique blend of action-RPG and Tower Defense games. At the beginning of the game, players will only have few heroes at their disposal, with additional classes becoming available by unlocking them with the right currency. One big difference from the original game is that players will be able to create Hero Decks made of up to 4 heroes that can be swapped on the fly at any time. This allows for better strategizing, as all Heroes not only come with different regular and special attacks but also different towers, which may be better suited depending on a specific map’s terrain. Heroes’ regular attacks and special skills, which come with a cooldown mechanic, are varied enough, but most of the times, the choice of which hero to use will depend on their towers, as they are way more powerful than special skills. 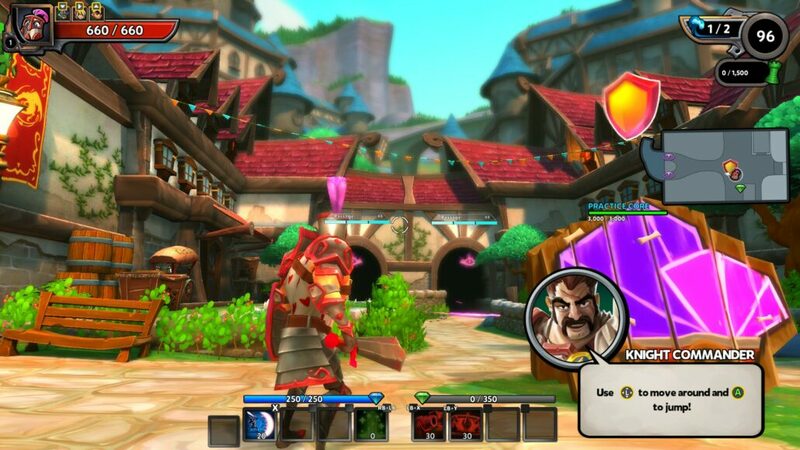 Dungeon Defenders II RPG elements don’t stop at the available heroes. All of them can be leveled up, which lets them learn new skills, improve already acquired ones and towers. All heroes can also be customized with a variety of items that can be obtained by defeating enemies on maps and more. The amount of loot that can be obtained is huge, so there’s plenty of customization possibilities. Sadly, the game doesn’t do a very good job in explaining differences between items, tower properties and more, as players need to navigate through multiple menus to learn more about them. Alongside the overly complicated menus, the controls, which aren’t exactly straightforward, are also one of the game’s biggest issues: it’s not unusual to start the defending phase accidentally while trying to place towers on the map. Dungeon Defenders II can be played solo without any problem, but it’s the multiplayer experience that makes it way more fun. Players can decide at the War Table found in the main town to join another player’s mission or just start one solo and allow others to join the game at any time. Those wishing to only have their friends join their game can head to the Tavern, which makes missions private. The town also sports several other facilities, like Shops and others. Being a free to play game, Dungeon Defenders II comes with several types of currencies. Playing through the game without spending real money is definitely doable, only that it will take quite a long time to unlock all Heroes. Even after completing the main campaign, however, there’s still plenty to do in the game, so any time investment may be worth it if you’re thinking about sticking to it in the long run. Aside from the overly complicated menus, Dungeon Defenders II presentation does its job well, with colorful characters and maps that give the game a cartoonish look. The game also has some low recommended system requirements, so it should perform well even on older machines. The soundtrack is also serviceable, enhancing the cartoonish feel of the game. At the end of the day, Dungeon Defenders II can be a quite fun experience, especially when played with others. It’s far from being one of the best games released this year, but it can provide a few hours of solid fun for fans of action RPG and tower defense games. Dungeon Defenders II offers the same unique blend of action RPG and tower defense games of its predecessor while adding some new features that deepen the experience. The tower defense elements are still more important than the action RPG ones, but there's still plenty to keep fans of both genres engaged. Things, however, can get grindy if you want to unlock everything without spending money, so don't expect the experience to feel fresh if you plan on doing so.